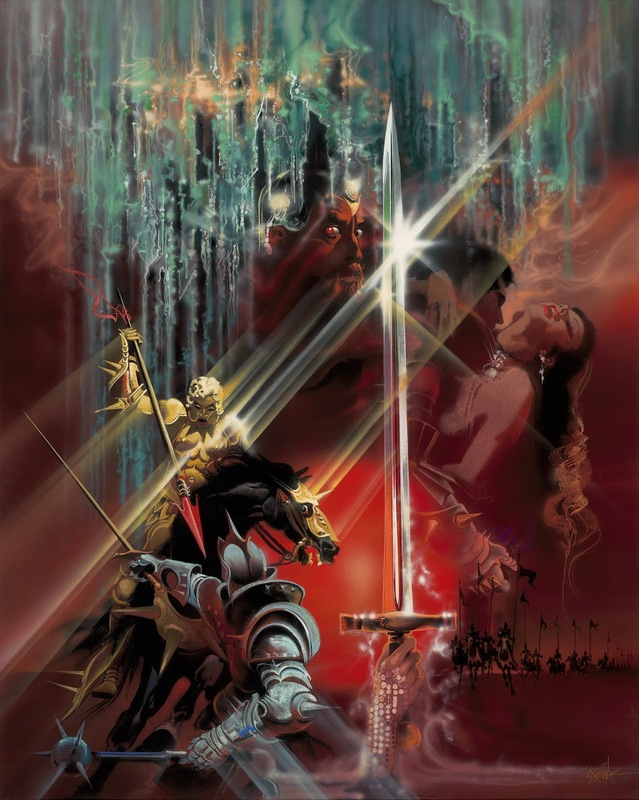 I watched Excalibur this weekend, for the first time in 15 or so years, and now that I think about it, perhaps the first time in which it wasn't cut up or edited for TV. That, along with advancing age, lended me a better viewing. It was a very 'fey' movie - the visuals and the 'green lighting' gave an ethereal quality to the whole thing. The structure of the movie, with these 3 or so "acts" broken up without a lot of segue, give a sort of feeling that you're scrying on these events from afar, skipping ahead to the parts that matter. It was based heavily on Le Morte d'Arthur, which I'm not sure I've read - T.H. 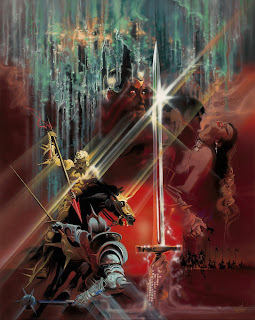 White's The Once and Future King had been my go-to as a youth for Arthurian legend. 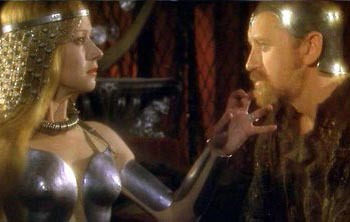 Nicol Williamson put on a great performance as Merlin - he adopted this odd sing-song cadence on occasion that made you think that, somewhere under that cap, there was this powerful mad wizard barely keeping it together to make this whole kingdom-establishing plan work. As the movie progressed I started thinking about how I'd present this under a DND-esque system. I recall 2E had Birthright, which (I think, correct me if I'm wrong) had some of this concept of the liege of the land being connected to said land. While the ruler is hale, happy, and active, the land thrives. In ACKS terms, we'd increase the income from each hex. Perhaps the kingdom would expand itself, and hexes would become "cleared" of their own accord - the Chaos receding against the light of civilization on it's own. Conversely, when the ruler is haggard, his wife is cheating on him with his best friend and champion, and maybe his half-sister tricked him into getting her with child, the kingdom contracts, the outer hexes turning to borderlands, then to wilderness. Settlements falter, and are abandoned, and Chaos comes ever closer. There's a fully realized system in there somewhere for someone who wants to do it. I wouldn't want to run it without computer support - I'm seeing a system where you're tracking morale-per-hex and cascading morale events around related hexes as events conspire. And that's too much for paper. A slightly connected thought I had - I was trying to determine Merlin's closest class equivalent. Assume with me, for the moment, we're running a campaign using the rules of the system I just proposed, where the health of the king is the health of the land. I posit Merlin would be a Druid under such a system - that the most balanced and peaceful land, for both man and nature, would be one under the divine protection of a strong king, and that druids in that campaign world would be striving to keep that idyllic, peaceful kingdom as large as possible. As Merlin intimated that his time in the world (and the time of all his kind in the face of the coming of the "One God", as he put it) was at an end, a last-ditch effort to use primal powers to ensure a bright future would be something one would go all-in on. Morgana, of course, is all wizard. Went bad as soon as she could. Something something Helen Mirren vs. Eva Green, we all win, etc. Animaniacs is back on The Hub, and I'm making sure my kids experience it. So, what's the Ranger really getting out of that, long term? What would some hypothetical tough guy opting for 2d8 at first level get out of his? I had some charts, but it ended up being a simple solution, so I'll skip them, for once. Toughness 1, which grants you 2d6+2*Con at 1st level, then regular progression thereafter, is met or exceeded by a character progressing from 1d8+Con at 4th level on average. Assuming you always roll max HP, it happens at 3rd level. And it's the exact same for 2d8+2*Con versus 1d10+Con with Toughness 2, except max HP matches out at 4th. Of course, they're always, on average, 1 HD ahead of their brethren only taking 1d6 or 1d8 at 1st level, maybe two hits if your Constitution is well above average. So, let's roll this back to what it's worth in ACKS. I said the extra 1d6+2*Con at first level was worth 1 custom power. If we take the Thief example, where 1 Build Point equals 3 proficiencies at it's first value purchase, I'm valuing what amounts to be, on average, 3 to 4 levels of higher HP as worth a third of spending that Build Point on Hit Die 2 (d8). That's not too bad. 4 levels (of beating a d8 character) is almost a third of the 14 level limit in ACKS. On the other hand, I've said that 2d8+2*Con is worth 2 custom powers - or, 2/3rds the cost of going from Hit Die 2 (d8) to HD 3 (d10). In practice, going from Hit Die 2 to Hit Die 3 is more expensive than just 1 Build Point for human characters - you've ended up with a character with a lot of HP, but not a lot of ability to apply it in combat, since you've got only 1 Build Point left. I could really only see doing it in a demihuman class that gains Fighting Value from it's Racial Points - like the Thrassians, in the ACKS:PC - Thrassian 4, HD 3, Fighting 1 would certainly be something to see (assuming that's legal, working without book-on-hand). The 'cost', then, of that extra 1 HP on average you gain from d8 to d10 HD isn't really worth it for the vast majority of builds. Is the cost of 2 proficiencies worth the single extra d8 hit dice? Assume for the moment whomever would want it would be a mostly Fighting class - let's say we're a Fighter, at HD 2 and Fighting 2. The absolute cheapest way I could think to go about it (feel free to correct) is to drop Weapons to Broad, and drop either Two-Weapon Fighting or Two-Handed Fighting styles. You'll gain the 2 proficiencies you need to get the extra die, and not impact your armor class any, while gaining 300XP/level in your experience requirements. Over the next 14 levels, that's a lot of extra XP you'll have to gain. Worth it? Maybe - if you're of the type that uses the 'reroll all HP each level, keep highest', then the extra d8 could be worth it. Done the usual way, it's a lucky roll at first level for it to make that much difference. But, in the end, the extra d6 is most likely worth a single custom power, so, by expectation, an extra d8 has to be either 1.5 powers or 2 powers. There's a dearth of things to spend .5 of a power on in ACKS, so it may as well be worth 2. And that's fine - things in ACKS that cost multiple powers aren't always worth it anyway. The other way to look at this proficiency is it gives you, on average, 1 extra hit point - that's the same effect as your Constitution going up. There's other proficiencies in ACKS that give you a bonus to-hit, which is the same effect as your Strength going up - certainly, the to-hit proficiences aren't applicable in all cases, but, the random die roll isn't guaranteeing more hit points either, so I think that evens out. I'll put that down as a 'good idea'. Way back here I was having the silly "let's talk about thief skills" thing everybody else does at least once and, in my fevered typing, came up with the idea of inverting Climb Walls to provide a mechanism by which a "good hit" can give a player an added effect in combat. I started from a standpoint of rolling high means you've done well, since that whole screed was drawn out of the thief skill table - so I completed that thought, and implied that a high roll for to-hit was a "good" hit - a quality strike, as opposed to a lucky one. Is it though? Against low-armored opponents, the argument can be made pretty clearly - if you've got a 50% chance to hit a guy in leather, and you roll a number that only occurs 5% or 10% of the time, you could extrapolate that that was a better quality hit than when you rolled one or two points over the minimum you needed. If our opponent wears plate and carries a large shield, however, it gets a bit dicey. You could be at a point where you're only able to hit that opponent on a 19 or 20 - was that necessarily a "quality" hit, that would justify an extra effect, or was that simply the best you could do to wound that opponent? I don't think it is. The proper way to invoke something like combat surprise would be to test the value of your roll as compared to the minimum value you need - once I know you've hit, I need to be able to put a numerical value on the roll that says "you exceeded your target number by X, and that's granting you Combat Surprise because it was a quality maneuver". Can that be done? Sure. If you go back to my post about Mutants and Mastermind 3E's Toughness save, you know it's been done. But that's way too darn complicated for ACKS and old-school speedy combat - let the combat trickery in ACKS stay as is, maybe let a natural 20 be a critical hit for everyone, if you're feeling it. So - Combat Surprise - bad idea. So there's that. The nice part about house rules is we don't have to get it completely right the first time. Prime source is, surprisingly enough, not Indiana Jones. Prime source is a character named Nathaniel Deacon Knibbs, whose player I DM'd for in a 3.5E game, going on some 8 or 9 years ago. Knibbs was, at level 10, a (wait for it) Cleric 3, Wizard 1, Rogue 2, Fighter 1, Human Paragon 3. His next ten levels would have been spent in Mystic Theurge. His Wizard side specialized in Enchantment. Looking at his character sheet, you'd be reminded of the Order of the Stick comic in which Nale realizes he's taken the long road to Bard as a fighter/rogue/sorcerer. It's not as bad as it sounds - the player was canny, and he had good stats. He played himself as the lovable rogue, and was, long term, bent on utilizing his connections with the church to further his own power. If only we'd had ACKS then! What we could have accomplished with the domain rules! At any rate. This is somewhat a pale imitation, as I'd really need 5 or 6 class build points (ACKS Player's Companion states 4 for human classes) to do it justice, and Knibbs wouldn't be caught dead being an elf ;) - nor would any multi-class solution true to the spirit of B/X or OD&D really contain the braggadocio of the original build in 3.5E. Some house rules were used, linked at the end. Empires rise and fall, civilizations destroy themselves in tragic opulence. Temples are erected, and their gods soon forgotten. Learned sorcerers build massive vaults of knowledge, and suddenly disappear. Ancient, alien creatures leave tantalizing clues about the true nature of the universe behind in cyclopean dungeons. All these are ripe for exploration and plunder - treasure beyond the dreams of avarice, knowledge never known by mortal. Here, then, comes the Fortune Hunter, the consummate adventurer, a jack of many trades. Some are lured by the promise of gold, some by ancient secrets, others by the promise of becoming legend themselves. Fortune Hunters are skilled combatants. At first level, fortune hunters hit an unarmored foe (AC 0) with an attack throw of 10+. They advance in attack throws and saving throws by two points every four levels of experience, as thieves. Fortune Hunters may wear leather armor or lighter, but may not carry shields. They can fight with a weapon in one hand, or with two weapons simultaneously but do not favor the bulk of two-handed weapons. In fact, fortune hunters don't spend more time fighting than necessary, and are only familiar with a small subset of weapons, depending on their culture. They choose from any 2 of the following 7 categories: (i) axes; (ii) bows/crossbows; (iii) flails/hammers/maces; (iv) swords/daggers; (v) spears/pole arms; (vi) bolas/darts/nets/slings/saps/staffs; (vii) any combination of 3 weapons. They may use any magical item usable by thieves. Time spent surrounded by trappings arcane and divine teach the fortune hunter a thing or two. The fortune hunter begins casting as a mage and cleric at the levels indicated on the table below. The fortune hunter's divine repertoire is based on 3 spells per level. The GM is welcome to customize this for his or her campaign. Whether or not the fortune hunter may cast arcane spells in armor is left to the GM, though it is recommended. Fortune hunters steep themselves in ancient lore. At 3rd level, they may read languages as a thief, with a proficiency throw of 5+. At 5th level, they've collected a number of totems and fetishes from various cults and religions, and the resultant effect is a +2 bonus on all saving throws. At 7th level, fortune hunters may read and cast from divine scrolls with a proficiency throw of 3+, with failure resulting in some backfire effect as determined by the GM. Fortune hunters deal in boldness - at 5th level, their confidence and aptitude inspire a +1 morale bonus in any henchmen they lead in their adventures. At 9th level, the fortune hunter may establish an institution, part stronghold, part museum, part university. When he does so, up to 1d4+1 * 10 0th level mercenaries and 1d6 fortune hunters of 1st-3rd level will come to apply for positions and learning. If hired, they must be paid standard rates. DESIGN NOTES: I reskinned Read and Cast from Arcane Scrolls to a divine version, under the theory that since the class has arcane spellcasting, it's covered from that angle. The fortune hunter gets it a bit earlier, but since divine scrolls are around half as likely as arcane I suppose it balances out. TRADEOFFS: 3 Thief skills - 2 traded for skills at 3,5,7. 1 from Fighting Style (shield), Armor from Unrestricted to Narrow for 2 more custom powers. HOUSE RULES USED: Half Value Spellcasting, turned Read/Cast Arcane Scrolls into a Divine version. So, here's the day late post. Talking about the mechanics or design of the game ought be better left to the game itself - it's free, and that's the key thing, and you can go make a judgement on your own terms. What BFRPG is, to establish my hyperbolic trajectory, is a culmination of what started so long ago, when wargames were first gaining their first person perspectives, and each group added their own rules for their own game. Those rules percolated around via mail and during conventions, and new product occasionally arose from it. That went away for a while, but, then Ryan Dancey, who can only assume was a time travelling mole from those early days, established the OGL. And set it all free again. Here we are, some 12 years later from when the gates opened, picking up where the 70s left off - the 'zines are mostly blogs, the games happen across the webcam rather than across the table, and men and women who just love gaming are spreading that love far and wide. There's definitions of the OSR that delineate it around game mechanics, or sandboxing campaigns, or character lethality, and so on. It's not that - never was. My money's made using open source software. That also started back in the 60s and 70s, when new ideas and code raced along a proto-Internet between universities, and came back with a vengeance in the mid-90s. I'm seeing that here at BFRPG again - the people and community who love an idea, and are putting that out there in the world so that other people can use it and love it too. The game itself, supplemental rules, enough adventures to last a campaign. Everything a kid would need to get themselves into this hobby, right there, a click away. That's the OSR - the people in it, the ideas being spread, the games being played. Games like BFRPG, spread widely, spread freely, are a cornerstone of this community. So, pop over there - to the Basic Fantasy Roleplaying Game and see what's going on. I just found an idea to use while I was scrolling through their website writing this post. What will you find? As an addendum, with the impending release of the next iteration of Dungeons & Dragons "proper" - having these open and free alternatives out in toe forefront when the wave of new interest spikes is of great importance. That's the "gimmie", the "first taste" that leads to branching out into other products, especially those that come out of the small publishers circling around the OSR.